Museums, art and culture might not immediately spring to mind when you think of Florida, but that's where the Gulf Coast steps in! Just as exciting as any swinging trapeze act, the Ringling Museum combines amazing art with a big top past. Travelling circus owner John Ringling was an art enthusiast who wanted to put his fine collection on show, settling on Sarasota as the spot to showcase. Well worth a visit is his family's decadent home and the Circus Museum, where travelling circus artefacts bring a fascinating past to life. St. Peterburg's Dali Museum is home to more than 2,000 works, with eight of these being the Spanish Surrealist's masterworks. And its stunning waterfront location makes it a must-see. While Tampa quietly goes about its arty business, with museums of Arts, Photographic Arts and Contemporary Arts. With the November weather sitting at a summery 21°C, Florida is tailor-made for getting out and about at this time of year! Keen cyclists among you will love testing out your pedal power on the Pinellas Trail – 39 miles of golden Gulf Coast scenery. Beaches whizz by, parks pop up as you go and you might even encounter some of the wonderful islands on your two wheeled adventure. 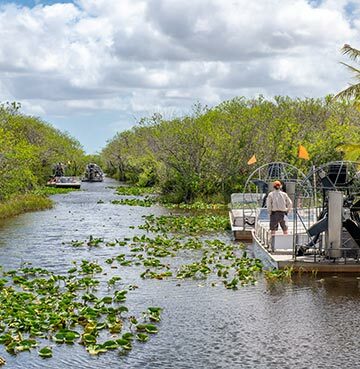 Swap bikes for airboats on a day trip to the Everglades National Park! These famous swamps and mangroves are home to some spectacular wildlife, so keep your eyes peeled for alligators, eagles, manatees and more. The Gulf Coast has another nature surprise up its sleeve – the fantastic parks you'll find dotted around. And Lettuce Lake Park might just be the pick of the bunch, it certainly has the best name anyway. With its paths and cypress trees wrapping around the Hillsborough River and an observation tower to take it all, what could be better!? Get ready for park picnics, boardwalks and bird spotting. 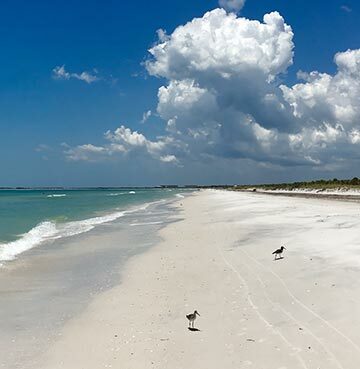 When it comes to beaches, the Gulf Coast glitters with golden sands and beaming white strips! Clearwater is perhaps the most sparkling, adding sunset entertainment to its wealth of activities. Boat trips are made even more amazing by pods of dolphin offshore and family swims are far more comfortable in the calm and shallow waters. Sunsets at Pier 60 bring local performers, craftsmen and movies in the evening glow – a great end to a great day! At the tip of Clearwater sits Caladesi Island, so idyllic it feels a millions miles away from one of Florida's most bustling beaches. Kayak through the mangroves on a paddle out to sea, or simply walk through the woodland to set foot on the white shore. Its name might be a bit of a giveaway, but Siesta Key is a wonderful spot to unwind and soak in that November sunshine. But it's not all about those relaxing moments! There's loads to keep you entertained – so why not turn those snoozy siestas into fun fiestas? Parasailing, swimming and snorkelling are perfect for an offshore explore, while playgrounds and volleyball courts add just the right amount of sandy fun. Another secluded escape that's brimming with natural beauty, Honeymoon Island's name seems so very fitting. You can just picture couples walking hand in hand on these stunning sands, with the sea greens and blues dance around. It never seems to feel like winter in the Canary Islands, where the sun warms the shore all year long. So look no further for your winter escape. Gran Canaria in November almost feels too good to be true, there's just so much to see and do! And it's all enjoyed in a balmy average temperature of 25°C. After all, where else can you combine desert-like trekking with hiking towards the peaks of craggy mountains? Or spend a morning enjoying the type of culture you'd associate with a city break, before indulging in a little watersport fun in the afternoon. Gran Canaria hits the November holiday nail firmly on the head. 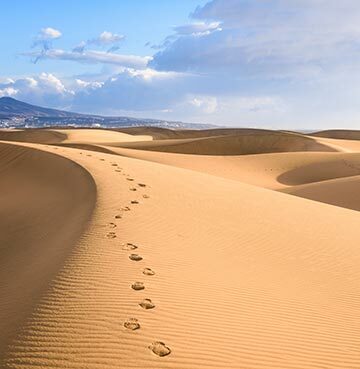 Before you've had your fill of sand, be sure to head for Maspalomas' dunes. Ridges and mounds shaped by the Atlantic breeze, there's a wonderful desert feel as you stroll here. Why not complete that sandy adventure with a camel ride across the dunes? That way you'll have no aching feet or tired legs to stop you making the most of the mountains at the heart of the island. Roque Nublo stands at a staggering 80m and true to its name (Cloud Rock), you'll soon find yourself up above that fluffy blanket of white. It might look a long way up, but before you start packing a big bag of supplies there's a car park just 15 minutes' walk away! 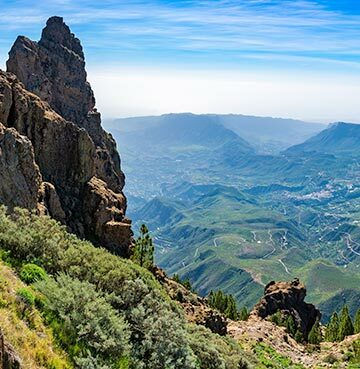 It's a similar story at Gran Canaria's highest peak, where ample parking for your hire car means the hikes are what you make of them. Stroll for as little or as long as you like! The summit of Pico de las Nieves might be off limits, but there's some breathtaking viewpoints dotted around it. So get ready for perfect panoramic pictures of volcanic rocks, dense forests and deep valleys – empty memory cards are a must! There's just one more stop on our tour of the island and that's the spectacular capital of Las Palmas. A historic city with a wonderful story to tell and luckily these walls do talk – in a sense anyway. Our tale starts in the late 15th century, when Christopher Columbus stopped here on his voyage to the Caribbean. It's said that he spent his evenings in the Casa de Colon, a brightly coloured yellow building with an impressively decorated façade. Also home to the Governor General, you're killing two historic birds with one cultural stone! British influence was felt for some time in this part of the island, its colonial architecture a tell-tale sign. From its art gallery to the El Museo Canario, telling the islands tale through artefacts, this is a melting pot of everything cultural. Be sure to amble around too, narrow streets are littered with colour buildings and intricate decorations – the charming cherry on the Las Palmas cake. November averages of 23°C might have you slinging on your swimwear and sliding into your flip flops at record speeds as you rush to the beach! And with a shoreline this beautiful and temperatures so toasty, who could blame you? But with the sun no longer at its scorching summer best, it might be time to discover a different side to the Algarve. Or at least a different side to its coastal glories! Benagil Sea Cave is as breathtaking as they come, with its small and mighty stretch of sand tucked away inside. The circular hole in the roof feels like Mother Nature shining a spotlight on one of her most beautiful children, flooding the cave with light. Praia do Barril is all the golden sand and clear water you'd expect, with a hefty helping of local history. 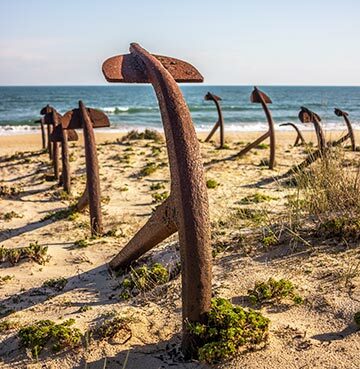 The Cemetery of Anchors you'll find here is a tribute to Tavira's fishing heritage, once used to hold down the nets that caught Tuna in whopping quantities. The village itself is absolutely oozing authenticity too! With its cobbled streets and charming squares, gazed lovingly upon by the castle above. 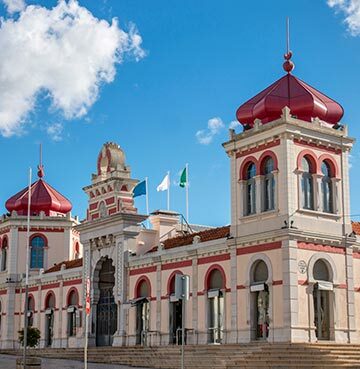 It's a similar story in Loule, the market town that's 100% Algarve local life as its best. November visits mean that you're far more likely to find residents going about their business than sightseers on day trips. So when you step inside that impressive market, Portuguese chatter is the soundtrack to searching for fresh produce and hand-crafted trinkets. Swap fruity haggling for fishy deals in Olhão, home to the Algarve's largest fishing port and market. The catch of the day truly is a catch in this historic town, where even the market dates back to 1915! Be sure to nose around before you grab that dinner delight and head back for your villa kitchen.